Now writes to multiple USB flash drives or data cards simultaneously! 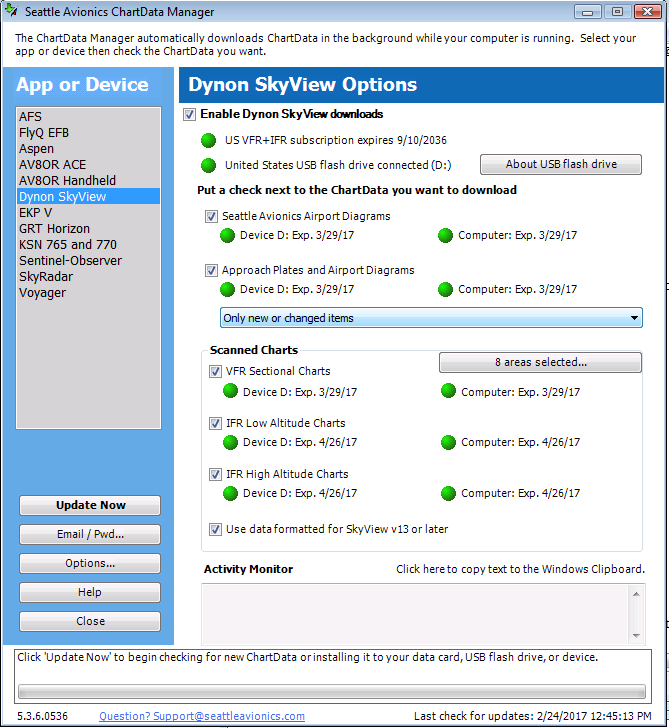 The Seattle Avionics Data Manager provides ChartData to about a dozen different apps and devices - certified, non-certified, portable devices, in-panel systems, you name it. Now new Data Manager version 5.3.6 takes everything to a whole new level of reliability and functionality. And for those who use multiple USB flash drives or data cards, you're in for quite a treat as it can now copy to multiple cards/flash drives simultaneously! If you don't already have it, click here to download it. If you already have the Data Manager and just need to update to the current version, simply start the Data Manager and hit 'Download Now' and the Data Manager will update itself unless your Windows security permissions do not allow it. In that case, please email technical support for more information. As of this writing, the current version of the Data Manager is 5.3.6.0536. This is shown in the lower left corner of the main window (as shown in the screenshot above). If you already have this version or a later one, there is no need to download anything else. Support for nearly a dozen different apps and devices including Dynon, Aspen, Bendix-King, GRT, AFS, AvMap, and more. Copies data to SD cards, USB memory sticks, etc. Automatic retries when download errors occurs. Substantial status information when the update cycle is running. Scanned charts (no plates) for the Caribbean, Gulf of Mexico, Southern Canada, and most of Mexico (Dynon, GRT, and AV8OR only at this time). A 'Storage Manager' that shows info about and can format USB drives and memory cards for some apps and devices. Expiration dates for all data products clearly visible on the screen. Support for Large Font mode including the super-large font mode in Windows 7 and later. The Data Manager automatically runs in the background when Windows starts so data is automatically downloaded rather than the user having to manually start the Data Manager and press the 'Update' button. This can be disabled in the Options screen. Less verbose logging in the Activity Monitor (no more “Will retry later” messages). Verbose logging can be restored in Options. New Support email link at the bottom of the app. When clicked, it asks if you’d like to send the ChartData Manager log file to support for additional help. The “Device” status sections note which drive letter the data is on. All-new first-time use system that asks which apps or devices you use and asks for your email and password. Also mentions that the first update will take longer than later ones.